Nayru's Pearl has the symbol of the Tune of Ages on it. This is similar to the shape of the Zora's Sapphire, but different. Jabun is the sea spirit. Din's Pearl is held by followers of Valoo, the sky spirit. Is Din the Sky Goddess? The Rito may hold Din's Pearl, but they also have the symbol of either stylized Zora or Nayru's Pearl on their clothes. And they are not really raptors. The Owl, sometimes named Kaepora Gaebora, is commonly called "wise" in the games. Also, the Gorons are never associated with Din. They hold the goron's Ruby at one point - but this is not Din's Pearl. It is the Goron's Ruby. Din is mainly the Earth Goddess - fire is just an attribute. In any case, the Gorons are living stones, not firey, so that connection really doesn't work either. Farore's Pearl is held by Deku Tree, the earth spirit. Is Farore the Earth Goddess? The Kokiri's Emerald is also held with the Deku Tree, and the Kokiri are forest spirits, but there is little to no evidence that the spiritual stones have any connection to the pearls besides being another triad of red/blue/green items needed to get a sword. Look at the Pure Metals in PH - same concept, completely unrelated. The Pearls have designs from Oracle of Ages. It's mostly aesthetics - for example, what does Din have to do with Currents? Snakes may have some connection to cunning, but wisdom, not so much. Raptors such as owls are generally associated with wisdom, instead. And herd animals like goats are hardly at all associated with courage. Monkeys, more with curiosity - you might make a connection between curiosity and courage, but it is very specious. The whole thing reads like this has been revealed in the games, by developers, or in real-world culture, but it simply hasn't been. PS - there's not yet been a Deku Forest. Deku Woods, yes, but that's in Labrynna. The three spirits of TWW are sea, sky, and earth - like Groudon, Kyogre, and Rayquaza. It's simply a triad, and they're not the only spirits that have held parts of a triad. I could give you the three great fairies of FS, since they are actually designed like the three oracles - this is kind of specious, but you have the Great Butterfly Fairy (of Flames), the Great Mayfly Fairy (of Ice), and the Great Dragonfly Fairy (of Forest). That backing might work, but the goddesses have not been confined to any races, and the Spiritual Stones are merely described as the races' treasures - they might have been found or taken by those races, instead of given. The Zora's Sapphire is treated like an engagement ring! And the Gorons see the Goron's Ruby as food! I agree with most of what you are saying, but certain recurrent themes do connect the Goddesses to the elements. Not every element is exclusively attributed to a particular Goddess, but there are connections present. The Zora's Sapphire is nearly indistinguishable from the symbol of the Tune of Ages, and on more than one occasion Nayru has been associated with both water and time. The purpose for the jewels is to open the Door of Time, however it is never revealed how or by whom they were created. As you stated, there is no reason to believe that the Goddesses had anything to do with the creation of the artifacts. But, that does not mean that the Goddesses are not connected to the stones at all. Din being associated with fire inherently associates her with the Spiritual Stone of Fire. Sorry, I meant the Kokiri Forest. Din is associated with the Earth, primarily because she is it's creator. More importantly, Din is the Goddess of Power, the one thing that the Gorons respect in their society. And as living stones, they are associated with the element of Earth. Saying that the Gorons viewed the Ruby as food is not necessarily accurate. One Goron stated that he'd like to eat it, but clearly Darunia did not share his sentiment, and regardless of that, how highly or little the respective races value the gems isn't really important. Din is never stated to be the Goddess of the Sky, however, she is associated with it by several themes in various games (The Rito having her pearl, Valoo being a fire breathing Dragon who resides within a volcano, Eldin having the appearance of a bird.) In the real world, yes, Owls are associated with wisdom, but that may or may not be the case in Hyrule, and it does not necessarily dissassociate Din from raptors altogether. But now that I think of it, you might be right about the Rito not being raptors, although they resemble birds. They don't even naturally have wings. They are, however, associated with Din. Regarding the comment about snakes: in different cultures different animals have different connotations. Depending on the culture, several animals are associated with virtues that aren't necessarily synonymous with their real world counterparts. None of what I've stated is explicitly revealed in game, but it is repetitively advocated in game after game. The Tune of Ages has the three extra circles. The Zora emblem does not. The Zora symbol may be based on the Ages symbol, but that does not mean that the Zora are her chosen people. Just because two things have fire in their names does not make them related. There are countless "fire" things in the games - for example, the Temple of Fire in Phantom Hourglass is dedicated to a servant of the Ocean King, not related to Din. The Snowhead Temple and its Fire Arrows are associated with the Northern Giant, not Din. And that the two temples of TWW are associated with worshipping the Triforce Gods, unlike the temples of OoT which worship the elemental spirits. If Din is the patron deity of the Gorons, as you claim, and the Goron's Ruby is associated with her, as you claim, then they would not view it as food. In the way the games depict it, it is a heirloom or possession of Darunia's, and one apparently not well known of by the race as a whole. The same goes with the other stone's - a possibly more likely case is that they were made by the architects of the Temple of Time, and given for safekeeping to the leaders of the three tribes. No association of the stones with the goddesses is made in the game, and the game goes on and on about the goddesses. Stone is not necessarily Earth. As TMC and TWW showed, it can more closely be associated with things that grow form the earth, like trees. You're making a circular argument here - I am arguing that the Rito and Valoo are probably not actually associated with Din because they are Sky-associated, and you are saying "they are because they are." Kaepora Gaebora and the other owls in the series are almost always called "the wise old owl", or something similar, and the Owl statues in Link's Awakening were specifically "to dispense wisdom". It may be that Hyrule and Earth have drastically different symbology, but you are making the light spirit animal choice associations up out of whole cloth, with no clear basis in either realm. If it's not explicitly revealed, how can it be "repetitively advocated"? For the snake thing, I'm not getting how you see snakes constantly associated with wisdom - the only other snakes in the series I know of are Dodongo Snakes (which eat things that kill them, all the time), and the Desert Colossus, which is the Gerudo's "Goddess of sand", and not at all related to wisdom or the Zora. Same with the raptor, the goat, and the lemur - the lemur could possibly be the closest, since on Earth primates are "known" for curiosity - but the rest is pure fancy. The water thing has not been repeatedly advocated - the only example you can come up with is the claim that the Zora are Nayru's chosen race....but the games say over and over that the Hylia are the Goddesses [only] chosen race - even in TP, when they introduce a race "made before the Hylia", they still say that the Hylia are more favored. None of these three races are ever shown to worship the Goddesses - hell, the Kokiri don't even seem to know anything about them! It is only the spirits (Great Deku Tree) and the Hylia (Zelda) that ever speak of the Goddesses. I have made the changes on the page because I have discussed it (on this talk page, though, but you were the one dissenting so it's essentially the same), and there was still no evidence provided for your assertions, and much evidence against. The link to specific races would actually more likely work in the reverse, since a Zora was the sage of the Earth Temple, not a Goron. The Kokiri one appears more clear, but arguing about who held the gems and stone's doesn't help much, since we have no persuasive evidence that the stones have anything to do with anything but the door, and the pearls appear to be given to the wrong spirits, if the association holds true - after all, Komali, who holds Din's Pearl, has the Zora symbol on his clothes - that's two solid points towards Din-Zora, and the Earth spirit protects Farore's Pearl. Nayru's Pearl is held by the Sea Spirit, though, which is pretty much the only solid hit for Nayru-water - unless the blue Nayru's Love and PH wisdom barriers are assumed to be magicked water, which it really doesn't look like. The other is the FS Great Fairy of Ice-Nayru link, which is still somewhat a stretch - it would be simpler to just say "Nayru is somewhat associated with ice", and not reach to claim something we can't prove. Especially the "landmark" thing - TP was the first game that associated the goddesses with any particular area, and even given that it was still named after the light spirits, not the goddesses directly, the main features of the provinces are still field - they all have a river going through them, as well as canyons and some peaks. There can possibly be made the further claim that the Goddesses are worshipped in the three temples dedicated to the Master Sword - the temples in which the sages pray to the goddesses to protect or boon the Master Sword's power: Wind, Earth, and Time. On the Tingle Tuner, Tingle refers to Farore as the God/dess of Wind - it's somewhere in the southern quadrant, if I can get time out of classes I'll provide the exact quote. That indicates that the Wind Triforce temple is probably her's. This is backed up somewhat in PH, when Link can use courage gems to perform a wind-like attack. Once again I agree with some of what you've said, but there are a few problems. I think you've misunderstood me. For the record, I've never suggested that any of the Goddesses had a "chosen people", or that they were the matron deities of any race. I merely stated that there are peoples who reflect the goddesses respective virtues, such as power (Din-Gorons). The Goddesses are only mentioned on two occasions in OOT. Kaepora is never refered to in game by anyone/thing other than a few Gossip Stones. Owls may represent wisdom, however, both TP and TWW associate Din with birds. In the said context, "advocated" is synonymous with "suggested." Dodongos aren't snakes. The Baby Dodongo may slightly resemble a snake, but other than that, well, there aren't any species of snake with legs. Besides, most enemies are monsters, not normal animals. Clearly, the remarkable similarity between the Spritiual Stone of Water and the Symbol of the Tune of Ages is not coincidental. They're virtually identicle. Jabun holding the Nayru's pearl is yet another example of the water connection. Lanayru's role as a rainbringer is another connection. These are three connections. Nayru's Love need not have anything to do with water, and that seems to be the only venue you're truly concerned with. Once again, I've never said that Nayru has a chosen race. Even if you choose to ignore the similarities between the symbols, the connection is there. What is there to be debated? No circular argument, I'm saying that Din is associated with Valoo and the Rito because A: They have Din's pearl, B: In both WW and TP, Din is associated with birds, and the Rito are birdlike people, and C: Valoo is a firebreathing Dragon. To be honest, in game, Din is more closely associated with fire than anything else. The Goddesses have little involvement in any of the events of Majora's Mask. The Goddesses appearances are not exactly known; aside from their appearances in the creation story, the only representations of them are statues, which may vastly differ in appearence. What's the difference between ages and time? "both TP and TWW associate Din with birds." - again, you're using a circular argument and assuming you're right to prove what you're assuming. While I agree that Eldin is associated with Din, there's no good evidence that it's anything beside coincidence, and the Rito have much more connection to the Zora - unless the Zora are also a race representing Din; still, the Rito worship Wind and Sky spirits, and their whole persona is developed around being free of the Earth. There may be some coincidences going both ways - but its overall safer to just not try to claim something with such little proof. I withdraw my claim about owls being called "wise" - while I'm only able to find quotes with "wise", "owl", or "wisdom" in them, and not actually quotes from the owl itself, I can't see anything supporting my claim. However, the Owl character almost always is used to give advice, and the OoX games feature many "wise Know-It-All Birds." "remarkable similarity between the Spritiual Stone of Water and the Symbol of the Tune of Ages is not coincidental" - and many would argue that the similarity between Majora's Mask and the Fused Shadows is not a coincidence; even I have tried to show how the symbol on the Rito Chieftain's robes are a stylized Zora emblem. The problem is that they are not the same, and repetitive claims will not prove us right. For the record, the Zora emblem, as shown in The Wind Waker multiple times, does not have the three circles, while the Tune of Ages does. "Jabun holding the Nayru's pearl" - is one example, and it appears to be based on a landtype triad, rather than an elemental - exactly like Rayquaza, Kyogre, and Groudon. "Lanayru's role" - all we know is that she was praying to Lanayru to solve the problem faced by the province he protects. There is nothing to indicate that the other light spirits could not also bring rain, or that Lanayru could himself. ":No circular argument, I'm saying that Din is associated with Valoo and the Rito because A: They have Din's pearl, B: In both WW and TP, Din is associated with birds, and the Rito are birdlike people, and C: Valoo is a firebreathing Dragon. To be honest, in game, Din is more closely associated with fire than anything else." It's exactly a circular argument, because your claim that Din is associated with birds is due to you assuming she is associated with the Rito! And again, the Rito worship sky and wind spirits - claiming that Valoo is fire-elemental just because he breathes fire would make half the enemies in the game, even those that appear in Shadow, Wind, Spirit, or other temples as associated with Din. "what's the difference between ages and time"-...seriously? one is the dimension/element controlled, one is how the land is unique due to that control. The same as Seasons and Nature. "The Rito aren't the Zora, they descended from them, which is probably the reason why they wear the symbol of the Zora. Laruto being the Earth Sage does not mean that Zoras aren't associated with Nayru. For example, Ciela is the spirit of Courage, and Time. Does this dissociate Nayru from Time, simply because Courage is a virtue of Farore, or vice versa? Certainly not. It is merely an overlap." The evolution theory is on very awkward ground, as I have been forced to discover. "Laruto/Earth Sage" - but it is a strong hit against it, as the Nayru connection is based on the very weak assumption that the Zora's Sapphire is associated with Nayru, while the Laruto-Earth connection is explicitly made in the game. This is why it's not smart to outright claim a connection with so many contradictions. As for Ciela - it seemed more to be a connection to the seeming connect between life and time - then again, since she was using Phantom Spheres, associated with life force and thus Oshus, it is perfectly possible that all three spirits could do this. I don't understand why you reverted most of my changes - the "Goddess of Time" bit, as you have written it, indicates that the characters believe this, and you removed the explicit references to the Ganondorf-Triforce deal in TP. Especially since the burden of proof is on you to prove these connections, and you additionally removed the helpful edits discussed above, I'm going to have to re-revert and ask that you make your case on the discussion page before restoring the old version. If we're going to claim something on the article, it has to be something with solid, almost explicit backing, and with few if any contradictions. In fact, we should provide a reference for it if it's not explicitly shown in the games. For example, the landmark thing - Zora commonly live high in the mountains, which you associate with Din, and forests are only ever associated with "Earth". I've found something else - the Great Fairy of Forest, resembling Farore, holds the Earth-element inspired Key, the Great Fairy of Ice, resembling Nayru, holds the Water-element inspired Key, and the Great Fairy of Flame holds the Fire-element inspired Key. If we explain in the article that this is how we get these connections, we might be okay. But the race, landmark, and animal things have no good backing. I don't see what's circular about my argument, and I'm not sure if you realize the meaning of "association". The Rito had the Din's Pearl. That's an association with Din. Eldin has the appearance of a bird. That's a connection. Ganon, for example, is also associated with Din, because of the Triforce of Power. There are few facts concerning the Goddesses that are discussed or explicitly shown in game, and thus, much of the information regarding them must be gathered from not so obvious subject matter. The Nayru-Water connection most certainly exists, as you've even stated yourself. I simply reworded your "Goddess of Time" statement. Zora's Domain is not in the mountains in any game. In both OOT and TP it is on a cliffside with a tributary waterfall. Din is associated with Death Mountain, a volcano. In TWW, her Pearl was also on a volcanic isle. Since her first appearance in OOT, Farore has been associated with Forest, mainly because of her connection to Link. Hr pearl is also in the Forest Haven. Another connection between Farore and Forest is that the last few seconds of the Ballad of Gales (keeping in mind that Farore is the Wind Goddess) is the Minuet of Forest. Laruto says that Medli is her descendant. Simply because the Rito are associated with Din (via the pearl) does not mean that the Zora are as well, even if they are connected, or even if they were once the same race. The connection between the Spiritual Stone of Water and Nayru's pearl is undeniable; it's almost the exact same design, same colors, and the similarity is clearly not coincidental. Valoo also lives atop a volcano; a fire temple. He is associated with Din moreso than any other goddess. In Twilight Princess, it was never explicitly stated how Ganondorf came to possess the Triforce of Power, or that he possessed it before the execution attempt. If you can prove otherwise, please cite it. What do the Gerudo have to do with power? They're an all female race of theives. Ganon is the only Gerudo associated with power. In the Goron society, power is the most important thing of all. It determines who will lead them. The other two are passable. ...While Komali and Medli may be associated with Din's Pearl, there is nothing but your claim saying that TWW shows birds as related to Din. "::":No circular argument, I'm saying that Din is associated with Valoo and the Rito because A: They have Din's pearl, B: In both WW and TP, Din is associated with birds, and the Rito are birdlike people, and C: Valoo is a firebreathing Dragon. To be honest, in game, Din is more closely associated with fire than anything else."" THIS IS A CIRCULAR ARGUMENT. IT IS NOTHING BUT A CIRCULAR ARGUMENT. I know damn well what an "association" is, and I know what a circular argument is. The Nayru-water connection only exists in the games through the Great Fairy of Ice/Water Element connection, which is several links to get from one to the other. This is the only one, and it is indirect. Zora's Domain is in the mountains in every game it appears in. It is at the base of Death Mountain in ALttP, it is high up in the mountains in OoT, and it is even higher up in the Snowpeak mountains in TP. It even says this in-game, I believe. "Din is associated with Death Mountain, a volcano." "Since her first appearance in OOT, Farore has been associated with Forest, mainly because of her connection to Link." "Another connection between Farore and Forest is that the last few seconds of the Ballad of Gales"
The Ballad of Gales is dedicated to Cyclos. If Farore is the wind god, then it is the "Wind God's Aria" that is dedicated to her. "Laruto says that Medli is her descendant." Please go to the Rito article. This has been discussed to death, its not nearly as simple as you think. "Simply because the Rito are associated with Din (via the pearl) does not mean that the Zora are as well, even if they are connected, or even if they were once the same race." A Zora is the sage of the Earth Temple, and those most associated with the pearl wear the Zora emblem. "The connection between the Spiritual Stone of Water and Nayru's pearl is undeniable; it's almost the exact same design, same colors, and the similarity is clearly not coincidental." Except that the official Zora Emblem, according to TWW, does not have the three circles. They are about as different as the Triforce and the Hylian emblem - and keep in mind that a Gerudo holds a Triforce emblem, or the Spirit and Currents emblems. It is deniable, because the symbols are different. "Valoo also lives atop a volcano; a fire temple. He is associated with Din moreso than any other goddess." Another circular argument. You assume he's associated with Din "because he is". Valoo is closely associated with the fire spirit Volvagia, and the OoT Fire Temple is dedicated to "the fire spirits". Is the snake-like Volvagia also associated with Din "because he is"? You are assuming that Din=mountain because mountain=Valoo=Din, and any which order of these things. Valoo is, as always, a sky spirit - if you're going to use the Jabun as a sea spirit argument for Nayru, then Valoo and Deku Tree wreck your argument completely. "In Twilight Princess, it was never explicitly stated how Ganondorf came to possess the Triforce of Power, or that he possessed it before the execution attempt. If you can prove otherwise, please cite it." ...really? I provide the exact times its said, and you still can't find it? Sages: "He had been blessed by the gods." and "We underestimated him. Ganondorf: "Their hatred echoed across the void, and its darkness revived my power." It outright explains that the sages thought that even with the ToP, they thought they could take Ganondorf - and according to G, this was because his magic had been drained from him - but that they were stupid, and took him to where the darkness revived him. "What do the Gerudo have to do with power? They're an all female race of theives. Ganon is the only Gerudo associated with power. In the Goron society, power is the most important thing of all. It determines who will lead them. The other two are passable." ...They're always talking about how every 100 years there will be one "powerful king to lead them", and they are the strongest fighters in the game. Ganon is their king and god, and they nearly always talk about power. The Gorons do not choose their leader based on power, because neither Biggoron nor the "brother" who constantly saves them (Link) are asked to lead. Rather, they are lead by "Elders", as shown in every game with Gorons in it (minus The Wind Waker, I guess). Speed, dancing, etc., are more important to the Gorons, as explained in actual quotes. The game of associating landforms with the goddesses by who lives there is the worst try yet - since Link actually lives in a farming village, not a forest, and Ganon is not from Kakariko Village in TP. Also, the "essence" thing is separate from what they are the god "of" - wind, earth, and time. If the associations are correct, the essences are fire, ice/water, and soil/forest. I'd like to know your definition of "association". It seems that you mean "direct correlation". Perhaps both Din and Farore are associated with the Earth, then. The Hylian symbol and the Triforce are connected, are they not? The Zora's Sapphire and Nayru's pearl are associated in the same manner. Neither of those quotes explain exactly how Ganondorf came to possess the Triforce of Power. It is clear that the Sages underestimated him. "Blessed with the power of the Gods" implys that he was given the Triforce of Power, not that he stole it from the Sacred Realm. It is never made apparent that the Sages knew he had the Triforce of Power beforehand. Zora's domain is not in the Snowpeak Mountains in TP. It is in a cliffside, near the mountains. In OOT it is in a somewhat mountainous region. This is a trivial argument. In their only appearance in OOT (MM being irrelevant,) The Gerudo never speak of a powerful king, only that the sole male born every century is king by birthright. Only a few of them actually speak, excluding Ganondorf, Nabooru, Koume and Kotake. To say that they are the most powerful fighters in game is false, unless you consider Iron Knuckles to be Gerudo, which they aren't. Biggoron is not necessarily the most powerful Goron, merely the biggest, and Link isn't considered to be strong by their standards, merely brave. In TP it is explicitly stated that the Gorons respect only strength, and that Darbus, their leader, is the strongest. Dancing is never said to be important. The Hylian symbol and the Triforce are blatantly connected - the Hylian emblem is based on the Triforce. However, the situation is in the reverse if your claim is correct - is Nayru's symbol based on the Zoras? This seems quite odd. ...the sages say "we underestimated him", not "we were suddenly screwed by the Gods". The way they talk about it, it is clear that they knew it had already happened - that they thought that, even with the ToP, he was weak enough for them to deal with. Ganondorf agrees with this assessment - while the Triforce was used to escape, the sudden change in advantage is credited to the Twili, not the Triforce. Zora's domain is pretty high up in the mountains in TP, and Snowpeak is on the other side of a tunnel through one of the mountains. You can see the mountains from the field - when climbing up to Zora's Domain, you are climbing a mountain. The same is true in OoT - in fact, in Zora's Fountain, it is clear you are in a mountain lake. I mean hell, it's a river source. Rivers nearly always start in mountains. If someone lives at the river's source, 99% chances are they live in the mountains. It's not trivial because Snowpeak is as much a mountain as Death Mountain (apparently more of one, in TP), so just saying "Din is associated with mountains because there's a mountain in her province" is a very poor argument. Ordon is a farming province, at the edge of the forest province. There is some wooded area, but all of Ordona province is cultured - it is not until Link leaves Ordona province that he truly enters the woods. Link is a rancher, and while he lives just outside the main housing area, he still lives in what the map calls "the village". I know Ganondorf is not from Kakariko - I was trying to explain why that is a spurious way to search for connections, since you have to cherry pick to get the results you want - hell, Gerudo desert is on the opposite side of the map from Eldin. This is my problem with your method - you cherry pick the results you want, and when I raise contradictions, you claim that "it is an unneeded connection" or some such. The Gerudo also appear in FSA, and are mentioned in ALttP. And again, they worship Ganon, who symbolizes power, like a god. However, in OoT, you're right, they focus on courage and skill. In FSA: "That child is destined to be the mighty guardian of the Gerudo and the desert." In any case, the Gorons never seem to mention power at all in OoT, and the games clearly show that they have an elder-based society, not a military one like a power-bent would imply. The Zora don't seem to wise at all (just look at King Zora), though I would think most of them are normal; it is the Sheikah who are always associated with wisdom, via the eye and mask. And the Kokiri are afraid to even venture out of their homes - hardly representatives of courage. Again, Hyrule castle is almost always the center of the disorder - it is the main base of the villain in ALttP, OoT, TWW, FSA (somewhat), and TP. It is never shown as a bastion of order and law as your write-up implies. Din is believed to be the Goddess of Earth - it has not been explicitly said that she is, and we must explain how this assumption is made. It is dishonest to say something is, when we aren't sure of it - that is why wikipedia's are setup to present the facts, not overly analyze them. Which Goddess statue? The one on the Triangle islands or the one in the tower of the gods? If you're saying that the essence of Din is fire, then the means to find that would lend to water/love and forest/wind being the essences of Nayru and Farore. If you don't want to say that the essence is represented by whatever element, then you need to reword all of them, not just Nayru. Farore's essence is not represented by wind, unless you're deriving from the spells - and then you need to do the "love" thing for Nayru. Either way, wind is what she is the god of, not what she is - Din, according to what we agree on, is the god of earth, not fire. As I explained earlier, the "fittingly" bit claims that something has been explicitly presented - we have not been given anything saying "Farore is the Goddess of Life", so we can't word it like that, as it implies we are sure. We are not. The earth thing is presented as a contradiction in the games - for example, the Deku Tree has almost nothing to do with wind in TWW, and the Wind Element is on the opposite side of the world in size, climate, and location form Earth in TMC. It needs to be presented as a possible contradiction. The "Ordona is home to Link" thing is, again, misleading, and really doesn't need to be there. I removed the "Oracle of Ages, Seasons, and Secrets", since it was repeated four words later. 5.	the connection or relation of ideas, feelings, sensations, etc. ; correlation of elements of perception, reasoning, or the like. 6.	an idea, image, feeling, etc., suggested by or connected with something other than itself; an accompanying thought, emotion, or the like; an overtone or connotation: My associations with that painting are of springlike days." Yes, I see "association" as meaning "connection", and not just "possible coincidence". I reworded the attributes section to get rid of the essence thing you disagreed with, but I still don't see how Din is solidly associated with volcanoes - Death Mountain is often a sleeping volcano, and the only possible connection I could see would be in TP. I also reworded the Goddess of Time bit - the creation myth focuses on her creating the laws of physics, which do not include time - her Oracle is the much stronger connection. Except for a few bits (mountains, Hyrule Castle, and Link), all the connections you claimed are still there, and it's just a matter of wording. I've also found that, as a rule, anything prefaced by "notably" or "should not be confused with/should be mentioned" is lying. These phrases really shouldn't be used. You sure do type a lot. I am not talking about the "Zora Symbol", I am talking about the Spiritual Stone of Water, nicknamed the "Zora Sapphire". It's origins are unknown, and it may outdate the Zora Race itself. Perhaps the Spiritual Stone of Water's design is based on the design on Nayru's Pearl, which is "believed to have been owned by the Goddess herself", and is likely much older. The Sages believed that he obtained the Triforce of Power by a divine prank. So yes, they did believe that they were "screwed" by the gods. It is never made obvious that they knew he possessed it, and when it began resonating they acted as though they were suprised. It is never stated that the Sages did anything to Ganondorf other than capture him and chain him to a rock. The sages specifically say they underestimated him. If they had been screwed by the gods, they would not have blamed themselves. Ganondorf also does not mention any sudden reception of the Triforce - he talks about the Twili's dark power. In TP, Zora's Domain is in a cliffside at the foot of Snowpeak, not in the mountains themselves. And as I said, it is trivial. Snowpeak isn't in any province, just as the Gerudo Desert isn't. I said that Din is associated with volcanos, primarily because Death Mountain is in the Eldin Province, and the Din's pearl is found on a volcanic isle. Link's home is not designated as part of Ordon Village on the map, and the whole area is surrounded by forest called the Ordon Woods. Ordona is a forest province. I welcome your contradictions, if they are valid. I had forgotten about the Ordon Woods. Go ahead and add the "Ordon woods and Faron Woods are prominent parts of these provinces", or something similar. In ALTTP, the Theives do not worship Ganon, because before he gains the Triforce, they are all dead. The Gerudo follow Ganon by virtue of his birthright, not because they worship power. Ganon is the only Gerudo who worships power. Farore can be assumed to be the Goddess of life in the same manner that Din can be assumed to be the Goddess of the Earth. You haven't had any problems with that thus far. Let's not use a double standard. In a monarchy, the King is the law-maker. Hyrule Castle is often at the center of the struggle because it is the seat of the monarchy, and as such it is the prime target for a villain. It becomes the center of "disorder" (though that is not the proper term), once the villain overthrows the monarchy. So yes, Hyrule castle is associated with law. The circumstances surrounding the creation of the Spiritual stones are never revealed. Their purpose, however, is clear. They were "apparently created" for that purpose, but it is not clear that they were, or by whom. The only known time period in which the Goddesses were in Hyrule was at it's creation. Once again, the purpose of the pearls is clear, but the circumstances surrounding their creation are not. Perhaps by "underestimated" they mean that they did not expect that he would be "blessed with the power of the Gods", as they clearly state. Zora's Domain is on a cliff at the source of a tributary waterfall. High elevation does not necessarily mean mountain. I'm not sure which is taller, but the height of Death mountain is isn't relevant to what I'm arguing. The Goron Mines are inside of Death Mountain, so yes, you do actually go to Death Mountain, even if you only scale part of it. The volcano is the common attribute, not the village, which can commonly be found throughout Hyrule. They are called a "band of evil thieves", which does not accurately describe the Gerudo. Heck, Blind was implied to have been in this band, and he's a male. "Mighty King" is one vague connection. How about the mighty Goron ancestor that sealed away Volvagia with the Megaton Hammer? And then you have the examples from TP. Power is moreso associated with Gorons than any other race. The only allegedly explicit connection is Farore and the Wind temple, and you haven't cited it in the article. Din's Fire does not associate her with the Earth, and neither does the Oracle of Seasons. In TP it is made clear that Princess Zelda is the ruler of Hyrule. It is the center of law, regardless of what it may become for a relatively short period of time. "Disorder" is not quite the right term. I withdraw my claim about the stones being made by the sages - all that is ever said about them is that "they are the races' hidden treasures", and that they open the Door to Time. However, Ganondorf calls them "the keys", and they are never mentioned anywhere near mentions of the goddesses. I maintain that there is no evidence of connection besides them being a triad of things. Meanwhile, the pearls are specifically said to be gifts from the goddesses. Sages: "We overestimated our abilities as sages and attempted to put an end to Ganondorf's evil magic..."
power turned to purest malice...Perhaps that evil power has been passed on to Zant..."
Ganondorf: "Their hatred bled across the void and awakened me. I drew deep of it and grew strong again." Notes: I know it's a bit of a distinction, but "had been" implies that he had been blessed before he was brought to justice. Furthermore, the sages specifically link their overestimation to their ability to end his evil magic, not overpower the Triforce. They never blame the goddesses for their foolish act - they blame themselves. Even when discussing his possession of the Triforce, they immediately go back to how his evil magic is important. Furthermore, Ganondorf specifically credits his sudden revival to the Twili's darkness. NOT THE TRIFORCE. This is how I worded it in the article, and what the game specifically says. "Now, Nabooru's gang of thieves stands for cruelty and brutality." - in the Adult Timeline, the Gerudo were regarded as evil thieves. Furthermore, Blind is a member of the Kakariko Thieves, several of which you meet in the game, not Ganon's Race of Thieves. (The original ALttP manual specifically calls them a "race"). "Gorons like to match strength in sumo contests." Something that is only shown in one game - for example, in OoA, they are all about games. Seeing as Sumo wrestling is just another game, OoA actually says that it is dancing that brings esteem to a Goron, and OoT and MM both have music and dance being very important to them, I would actually pin them as a tribe loving the arts and games. There is simply no evidence pointing to them being a tribe obsessed with power, especially since Link only needs heavier boots to completely throw them around. The definition of a mountain is dependent on height. 1000 ft, I believe. "Some waterfalls form in mountain environments where the erosive water force is high and stream courses may be subject to sudden and catastrophic change. In such cases, the waterfall may not be the end product of many years of water action over a region, but rather the result of relatively sudden geological processes such as landslides, faults or volcanic action." I don't know how else to explain this to you - rivers usually come from mountains, and Zora's Domain is always at the base or top of a great mountain waterfall. Hell, in OoT, it was right next to Death Mountain, at about the same elevation, and in TP, it was about halfway between the foothills and Snowpeak's summit. The Earth/Wind/Time triad is due to them all being temples dedicated to the Triforce and Master Sword, and in two of them, the sages specifically pray to the goddesses. Since Wind is Farore, and Time is almost certainly Nayru, that leaves Earth. The oracle bit is due to Nature=Earth being a connection shown in the games (Earth Spirit, Earth Element), about seasons and nature being equated to Earth frequently within OoS, and Din being the Oracle of Seasons. The spell bit was something the whole triad shared - I worded it incorrectly, but I was meaning to say that the temples, oracles, and spells were the only explicit connections we have, and everything else is something we attempt to reason out from that. "Law" is never mentioned in TP, the soldiers themselves act cowardly and are called cowardly, and the market is in general in a state of disarray - this even though Zant has had no noticeable effect on them. It is even commented on that either the Town-dwellers are either so used to being conquered or so busy with their own chaotic lives that not even the soldiers notice the giant golden crystal of doom enclosing the castle. Zelda's lack of connect with the people is such that, even with the crystal, some dwellers still can't think of a reason why they never see Zelda. The Castle and Town are exemplified by disorder and chaos in the series, and to suggest otherwise is to thumb your nose at what is plainly presented in almost every game of the series. The spell is called "love". How can you presume to know what power love has in the Zelda world? It may very well manifest as a shield appearing like light - just look at the Yeti, they created a heart container, and they're not even demigods. The volcano is not the most important part of Eldin Province - the focus is on the village, the volcano itself is somewhere the people hardly even go - the Gorons themselves use it as a mine/prison only. The same goes for TWW - the volcano is an out-of-the-way place which you're only asked to explore because there's a problem. The bulk of the activity is in the village, unlike in Lanayru, where it is lake AND towns, or Faron, where it is forest AND subforest. Death Mountain may be a prominent feature, but it's not the focus of the province, and we shouldn't claim it is - we can mention it's there, and let the reader draw their own conclusions, though, but anything more approaches dishonesty. They are called "servants of the tower" I grant you, but I never suggested they were the goddesses themselves. However, are a clear triad, are directly associated with the goddesses, and have extremely stylized appearances that still contain certain similarities to the oracle and fairy depiction. The Sages entire epilogue was in the past tense. Them saying that "he had" been blessed does not indicate when he was blessed. And by definition, being blessed indicates that the blessing is given to the holder, not stolen by him. Yes the Twili's magic revitalized him. Conclusions can be drawn, but it is not explicitly explain why he had the Triforce. "Divine Prank" makes it sound like the Goddesses had something to do with him gaining it. You may be right about Blind, though I don't recall any references to any gangs of theives other than the one Ganondorf led. Also, Blind working in accordance with Ganon is another connection. Nevertheless, is stated he killed off all of his followers when they found their way into the Sacred Realm, so if the gang of theives mentioned are indeed the Gerudo, which they may or may not have been, they weren't worshipping him because they were dead. 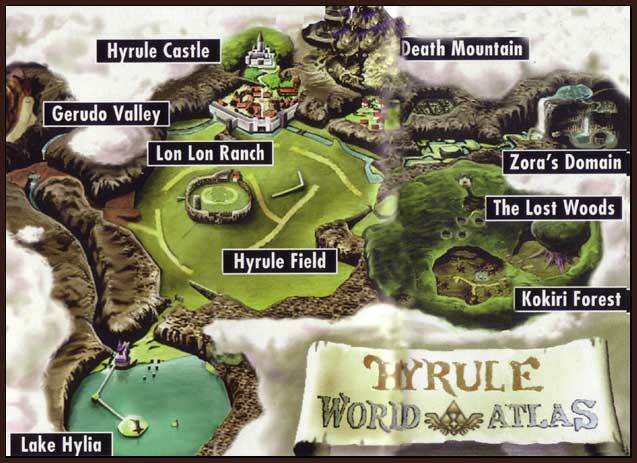 In that map, Death Mountain is at a higher altitude than Zora's Domain, and for the zillionth time, it's irrelevant. Zora's Domain is usually at the foot of a mountain at a higher elevation than the fields of Hyrule. My assertion was that there's a connection between Din and volcanos. Sumo Wrestling isn't really a game; it's closer to a martial art. I never said the Gorons were obsessed with power, I said that they best exemplify physical power. Link is pretty damn strong, too. I think you're majoring in the minors. Regardless of the disorder in Hyrule Castle and it's surrounding town, or it's cowardly soldiers, it is the seat of the primary lawmaker, the ruler of the monarchy, Princess Zelda. I disagree that Castle Town epitomizes disorder, nevertheless, I never said that it was the epitome of order, but that it is the basis of law. As you said, if it doesn't apply in all situations, it doesn't apply at all. "Love" does not produce a shield of light in every situation, nor does it produce a Heart container. The scene involving Yeto and Yeta was clearly for comic relief. And who says you have to be a demi-god to create a Heart Container? For one, the Gorons live in Death Mountain, and the mine there is considered by the Gorons to be sacred, not to mention that it is the source of their food. It is never stated that it normally functions as a prison; the only "prisoner" there was Darbus, who in his Twilit form, if you recall, was huge. There aren't many other places they could have kept him. Anyway, the most frequented area is not necessarily the most prominent, as the two terms are not synonymous. Could you point out any of the similarities between the Statues and the Oracles? I didn't notice that the Statues were distinguishable from one another. Whether he received the Triforce by accident or not, it was not the catalyst of his escape - the sage's quotes imply that they should have foreseen his escape, and he himself gives credit to the Twili - he's very arrogant, why would he give credit if he didn't have to? You meet several members of a gang of thieves during the game. One of them lives near the desert and opens a treasure chest for you. I'll agree that Zora's Domain doesn't seem to be at the peak, but neither does it seem to be at the foothills. Zora's Fountain is clearly a mountain spring or lake in OoT, and it's only in ALttP where the domain can truly be considered "at the base". Every other time, it's pretty high up in the mountains. ...It was a game in TP. And they treated it as such. They also have a stated obsession with mini-games in OoA. And Midna also explains that Zelda was a very weak, poor ruler, even before Zant. So, no. While it may be where the monarchy lives, it's never been particularly known for law and/or order. Hell, Ganondorf executes more laws than Zelda ever did. If it's an assumption, yes. The Nayru-Love connection is explicitly made in the games. As for the gods never producing Heart Containers - if you donate enough to the priest in TP, a piece of heart falls from the sky. Sooo...yeah. The mine has a very great multitude of barred doors and walls, like the sliding ones. While it's important to the Gorons, it's never shown to be a place where Gorons usually go - in fact, they claim to spend way more time in the hot springs, and the water areas especially of the Mines would be impossible for a Goron to traverse. It may be a source of food, but it is as important to their culture as a farm is to city life - technically necessary, but not often thought of. If it really was so prominent in their lives, they wouldn't be able to lock Darbus in there, because it would have completely destroyed their lives. The hot springs are the major part of Goron culture, and that is why they visit Kakariko. Kakariko is the center of the lives of the Gorons and humans in Eldin. Death Mountain is ancillary. I'd have to get the disc, but they do have differences. I copied them down onto paper, once. My point is that it is not explained how he got the Triforce. You're saying that it has been explained, but it hasn't. Just change it. For one, I don't recall Midna ever saying that Zelda was a weak or poor ruler; she disliked the world of light, but she never insults Zelda. Zelda is certainly a wise ruler, and whether weak or strong, Zelda is the law-maker in TP. Hyrule Castle is where laws are made. What law has Ganondorf executed? Sumo wrestling is as much as a game as kickboxing. The purpose of the Sumo wrestling matches are to prove who's stronger. Mayor Bo explicitly states when he gives Link the boots that the only thing the Gorons respect is physical power. You missed my point completely. I didn't say that the Gods have or have not created Heart Containers. I said that perhaps it doesn't require divine power to make one. It is unknown how often the Gorons visit the mines, and it is said in game that the mines are sacred to them. Yes, they enjoy the hot springs, but that is recreation, not a necessity or a ritual of great importance. And the Hot springs are also in Death Mountain, high above Kakariko Villiage. The circumstances surrounding Darbus's imprisonment are unknown. Considering that in his twilit form is much larger than any entrance to the room in which he is held, it is possible that he transformed while in that room, or that the transformation was gradual. It is also clear that the Gorons were able to restrain him. No, I'm saying that it has been explained how he was revived - that it has little or nothing to do with Ganondorf obtaining the Triforce. Midna criticizes Zelda multiple times, insulting her as a weak ruler over and over, until Zelda sacrifices herself for Midna. Check a game script. As for Ganondorf, he did a lot of ruling according to OoT - the whole Lon Lon Ranch debacle, for instance. "A weak spirit is no match for the might of the Gorons!" "Master! Did you hear? There was a sumo match for the first time in forever!" "Oh ho ho... Just being powerful is nothing special, Brother." and Bo says: "Gorons like to match strength in sumo contests." Not a single quote about them respecting anything, and these quotes seem to imply instead that they merely treat it as a game. So no, Bo does not explicitly state that at all. And you missed my point - I was merely trying to show that love has had physical manifestations in the series (since you claimed it didn't, and that it was impossible to claim that it did), and that Heart Container's have been produced by the gods. I never said they all were. It's not necessary for Farore to create wind, either - you can do it with a Deku Leaf. "Besides sumo wrestling, the hot springs are all we have to look forward too. ", and many other quotes besides. The Hot Springs are a huge part of their culture, and that is explicitly stated in the game. The article doesn't reflect that. You said that it is explained how Ganondorf gained the Triforce. Looked at the game script. I don't see Midna insulting her anywhere. Find an actual quote; not an approximation, wherein she insults Zelda. Regardless, Zelda the lawmaker, and Hyrule, the capitol of the monarchy, are both associated with Nayru because they are both associated with law. Ganondorf took the ranch from Talon and gave it to Ingo. It's never stated that any is law imposed by Ganondorf. The closest thing to a law that Ganondorf has made is the warrant for Link's arrest made in ALLTP, and arguably that was issued by Agahnim. I guess you'll have to retract this statement as well. These are just two examples. There are more. You should look at the text dumps. There's a lot more there than what you think. And some of what you think is there isn't. The Hot Springs are for recreation, and to a more limited extent, commerce. They're of far less importance than the mines, their source of food, which they could not survive without. And as I said, the Hot Springs are in Death Mountain. "But Zant will never be my king! I have nothing but scorn for his supposed strength. Not that your Zelda is much better... "
"It still appalls me that this world of light is controlled by that princess. A carefree youth, a life of luxury...How does that teach duty?" ...you don't have any evidence of any of the monarchs being more than a figurehead, either. Ganondorf actually did things while in power. The most we've ever seen Zelda or King Hyrule do is to surrender the kingdom. "Regardless, Zelda the lawmaker, and Hyrule, the capitol of the monarchy, are both associated with Nayru because they are both associated with law. " Is circular reasoning again - I'm trying to show that the monarchy and Hyrule aren't well associated with being a center of law, you're taking it as an assumption. Sorry that I didn't find one of the permutations, but they have just as many quotes downplaying the sumo contests - they even claim that it is dying out. But fine, yes, the Gorons do recognize strength - but not to the point of it being center of their culture, by any means. Some of what I think is there isn't? I'm copying directly from the text dump. The Hot Springs are also in Kakariko, and no, they are not of less importance than the mine. They outright claim the springs as central to their culture - meanwhile, Gorons can live as far away as Hyrule Castle Town, indefinitely. However, those in Town aren't asking for mine-rocks, they ask for Hot Springwater. How can the mines be so central if they've allowed Bulblins to make full encampments? Most of the mine is deadly to Gorons even, what with the water - it seems to be just as much built by Bulblins as a hideout than by Gorons. Neither of those quotes say anything about Zelda being a weak ruler, and all things considered, Midna's opinion of her doesn't make her any less of a ruler. Zelda and the King have both made descisions that affected Hyrule as a whole, in game. In game, they are reffered to as rulers, and if they were figureheads, as you suggest, Zelda wouldn't have the authority to surrender Hyrule, or do just about anything else. And Midna wouldn't have said that the "world of light is controlled by that princess." Zelda being associated with Nayru is not an assumption. I say that Hyrule Castle, whioh is indisputably the capitol, is associated with law because it is where laws are made, regardless of who makes them. Hence the reason why antagonists choose to attack the castle instead of, say, Kakariko Villiage. It is the control center. Calling that a "circular argument" is a cop-out on your part. I wasn't saying anything about the sumo wrestling. I was stating that strength is the only quality that they recognize in judgement, hence, Darbus, the strongest, is their leader. So the Gorons are associated with power, fire (Darmani, Fire Sage, is one connection, there are many others), and at least to some extent, earth. The Hot Springs are in the side of Death Mountain, hundreds of feet above Kakariko villiage. They say that they enjoy the Hot Springs, never that it is central to their culture. The Spring water has a strengthening effect on the Gorons, and understandably, the one Goron who wanted to break through the wall of boulders required someone to drench him in hot spring water to achieve this feat. To my recollection, no other Goron asks for spring water. Bulbins are everywhere in Hyrule. They don't have an "encampment" so to speak, and from Gor Goron's statement, it is apparent that they recently infiltrated the mines. That doesn't lessen the importance of the mines, but it does make matterse worse for the Gorons. What in the Goron mines is deadly to the Gorons? Certainly not lava, or heat, which for the most part they have shown immunity to. Unless you have since changed your position, which you often do, I don’t how you could include this bit of information in the article. You also stated that the correlation should apply in every situation. Every boss in the game has a Heart Container. Cutting down grass and breaking pottery reveals recovery hearts. Moreover, the corpses of enemies you’ve killed yield Heart Containers and Recovery Hearts. Is love present in any of these instances? “We might as well delete everything not explicitly set out in quotes, because that is going a bit too far with credulity." I'm going to have to interject here. Without trying to censor this discussion, in my opinion it is no longer productive, and seems to be degenerating into the same kind of argument on the Rito article. I've fallen into this trap before myself (Zora), and recognise the problem; the focus has shifted from improving the article to answering arguments with counter-arguments, and further counter-counter-arguments. "I'm trying to explain why the things put into the article are not solidly backed up, and that we need to provide both the source of our claim and any points against it." If we are to do this, then both points of view should be expressed, rather than one, or neither. There should be supporting facts and if applicable, contradictions. So, according to you, the similarity between the Spiritual Stone of Water and Nayru's Pearl is a weak or unfounded association, and the fact that the pearl is held by a Water Spirit doesn't help it. I don't see how either is weaker than your assertion that because the Great Fairy of Ice looks like the statue of what may look like Nayru, and holds the Water Element, the connection exists, especially when statues depicting the Goddesses can vastly differ in appearance. The pearl is held by a sea spirit. Not the same thing, just like fire and sky, earth and wind are not the same thing. This is what I mean - if using the same method would contradict pretty much anything by using it on the other Goddesses, it's probably not an intended connection. The connections between Din and Fire, Farore and Wind imply that Nayru is also associated with love. You'll notice that I only modified the "goddess statue" thing - I did not put there in the first place (If I remember correctly, you added it). I'm all for removing that bit, but the Great Mayfly/Ice Fairy has almost the same appearance as Nayru the Oracle, and the three of them have the same color triad. Using the logic would contradict your preconceptions, and nothing else. As I suggested, perhaps Din is not the Goddess of the Earth. As I said, Nayru is never associated with the emotion love, because the spell simply provides a shield of light. Saying that Nayru is associated with light would be more accurate. I put the Goddess Statue bit there because you implied that she resembles the Goddess herself, while her true appearance is unknown. This page was last edited on 29 September 2009, at 16:40.